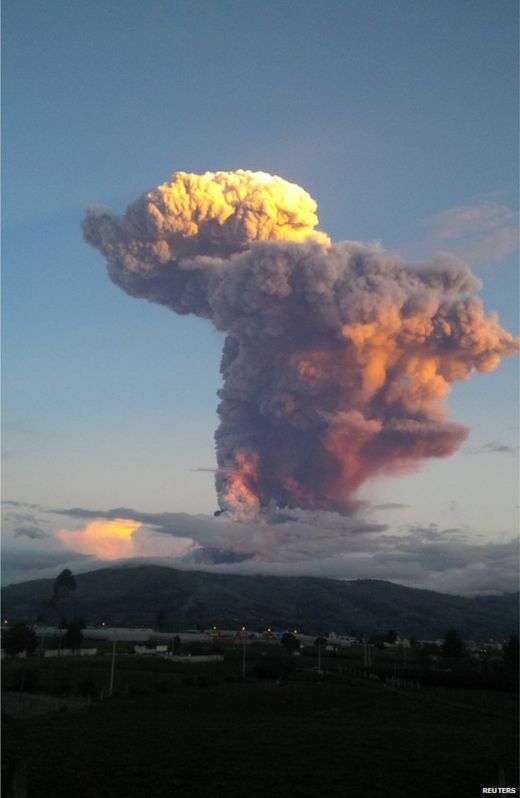 The Tungurahua volcano in Ecuador created a spectacular plume of ash, 10km (six miles) high on Friday in an eruption that lasted just five minutes. Check out the amazing photos from the eruption of Sangeang Api yesterday. Ash cloud has cancelled flights in Darwin. Have a look at the amazing blue flame colour (gas related) resulting from an eruption in the Afar region in Ethiopia - absolutely stunning. "Ethiopian volcano spews stunning, deadly blue gas"
The link below to CanIndia highlights a current article about a fissure which has opened up in the earth, which is spewing "flames and hot liquid steam", akin to a volcanic behaviour. It is located NW of India, on the southern edge of the Himalayas. If this is not a hoax, then it is quite amazing - a 'new' area. * On August 7th 2009, Earthweek reported on a mountain explosion on the 27th July 2009. This blast/explosion spewed 'water' down the slopes of the mountains, into peoples homes. It also possibly contained hydro-thermal gases and sulphur. A crater of 300 square meters and 20 feet deep opened up. Palampur SDM Bhupender Attri said a team of geologists from state had confirmed small scale magmatic activity in the area. As chances of this activity escalating in coming days cannot be ruled out, a GSI team has been called to study the area and check the strata. "Flames were witnessed so possibility of reoccurrence cannot be ruled out. Now we are waiting for the final report from GSI team," he added. Former state geologist Arun Sharma said occurrence of such a volcanic eruption has been reported for the first time in Himachal Pradesh but the presence of magmatic substance is not new to the state. He said that existence of hot sulphur springs at Manikaran, Kalath, Tattapni and Vashishth confirms that magmatic material is present underneath these springs. So...the reports of this activity actually don't surprise me. The combination of EQ activity and the nature of the geology etc. there, this possibly may be one of those 'surprises' that Mother Earth is offering up - which I have hinted at in the past. Hopefully this activity will not increase to an extent which could cause problems for the folks there. There is so much volcanic activity occurring around the planet, it can be hard to keep up with all of the info. Duckweather'ays "There is so much volcanic activity occurring around the planet, it can be hard to keep up with all of the info." It is actually a bit of a curiosity, let alone a bit concerning, to see so many volcanoes going off or at least regenerating, and even some once considered 'extinct' or dormant showing some grumbling. I think we may even see some more ocean based volcanoes possibly bubbling here and there. There may even be a region/location where there could be a 'surprise' volcanic behaviour. Remember the NW Indian volcanic activity recently, where there was a fissure open up and was spewing volcanic substances? That was very interesting and obviously probably a little worrying for some of the folks there. Also the volcanic islands which have risen and fallen again in recent times. The Japanese 'sea' volcano has actually joined with part of the Japanese lands, effectively expanding the land size and rewritten the 'mapping' of the region. I reckon that some volcanic activity may occur away from where the plates subduct (can cause nearby volcanoes to activate or be further irritated) inland on some continents....? I think the Natural Cycle community may be quite right there (though I don't know much about the science of Solar/Sun). I got thinking about Victoria's (Oz) volcanic regions and found the quote/partial article from The Age - dated August 11th, 2008. Lava volcanoes built the western lava plains. Very runny lava from these volcanoes streamed away, forming many of today's broad low hills. Lava volcanoes with stickier lava created much steeper slopes. The lava accumulated in and much closer to the vents. Scoria volcanoes are much more spectacular. Blasts of escaping gas spout out huge glowing fountains of frothed-up lumps of lava. It accumulates around the vent, producing cones. Lakes of lava often formed in the cones, and sometimes broke through the crater wall and flowed for a distance. Breached scoria cones like this are very common in Victoria. Many solidified lava lakes can now be seen as discs capping volcanic hills. - Mount Aitken, Red Rock and Mount Holden, between Sunbury and Gisborne. When hot magma rises into rocks that are close to the surface and contain lots of ground water, high pressure steam explosions blast magma and surrounding rocks into clouds of small fragments. The fragments build up to form a ridge around a shallow crater. These are maar volcanoes. - Tower Hill, near Warrnambool, is a group of scoria cones in a large, lake-filled maar crater. - Mount Rouse, near Penshurst, includes a large scoria cone with several smaller craters that produced a lava flow that is the longest in western Victoria, over 60 kilometres. - The scoria cone eruptions of Mount Noorat, Mount Leura and Mount Warrnambool have almost buried their former maar craters. Volcanic activity in Victoria climaxed between 360 and 370 million years ago during the last part of the Devonian period. At least six giant caldera volcanoes were active, some of them at the one time. Eruptions would have blanketed the surrounding areas in thick layers of ash, having a devastating impact on vegetation and early aquatic life. The gases and dust sent into the upper atmosphere mean the eruptions would have been felt globally. All of this ash has long since eroded, leaving only the harder volcanic layers that filled the calderas. These remains now form Mount Macedon, the Dandenong Ranges, the mountainous region between Healesville, Warburton and Eildon (including Mount Donna Buang and the Cerberean Ranges) and near Violet Town, in the northern part of the Strathbogie Ranges. Sources: Bill Birch, senior curator (geology) Museum Victoria; Volcanoes in Victoria by William B. Birch, Royal Society of Victoria 1994; Geo science Australia; Victorian Department of Primary Industries. Just as I felt there may be (and may be rather obvious actually), with all of the volcanic activity going on, there may be some considered 'extinct' or dormant volcanoes showing signs of activity. This article from EP is just one observation amongst several regarding several volcanoes showing signs of activity. "‘Extinct’ Costa Rican volcano being re-examined for activity, volcano dormant for 3,500 years"
I feel we will see some more inland locations or near coastline volcanoes showing signs of very slight to moderate irritations or increased ground or lake temperatures in the near future. There seems to be enough aggravation caused by plate movements (and faults in some places) and upwelling (magma and heat) happening in the 'regular' places across the planet, that some of this behaviour (I personally feel) is bound to spread to other regions. As for the sea volcanoes, I get a gut feeling that where the very long sea plates meet, for e.g. the trench running down the Atlantic (and possibly some other similar types of locations) may also pop up one or a few 'little surprises' in activity. I don't mean global disaster, but irritations which may become apparent in some places. The evidence for such may be discoloured waters, disturbed wave-tracking behaviour, risen land/sea forms and maybe even a small rise or dip in a local coastline somewhere. Things starting to look very interesting in Iceland with significant earthquake activity surrounding the Bardarbunga not too far from where the infamous 1783 Laki eruption wrought devastation. There have been more than 3,000 minor quakes or tremors since Saturday and activity does seem to be increasing with a 4.8 magnitude only 2.5km from the surface earlier today. The entire area has a thick 5-600m glacier over much of it thus giving a significant flooding potential should an eruption occur. Scientists monitoring the volcano have stated that the level of earthquake activity is an indicator of significant volumes of magma moving but there is no guarantee that it will reach the surface to cause an eruption. There are a few volcanoes in active mode or are actually erupting at the moment, as we have eluded to in the earthquake thread. Below is a live webcam of the Iceland volcano which has produced a fissure, 600 metres in length, and is spewing steam/smoke. Given that volcanic activity also produces earthquakes and harmonic and other tremors, this thread will overlap with the earthquake thread. I meant to add a link to the new Yellowstone National Park Service live-streaming camera. Here's a live webcam of the Baroarbunga volcanic eruption in Iceland. The fissure near Bardarbunga continues to pour out lava at volumes not seen in Iceland since the 19th century with no end in sight. This has not been an explosive eruption so far with no impact on air travel and so not much fuss has been made in the MSM, but make no mistake this has the potential to be an unprecedented event for modern civilisation. 1. Bardarbunga is Iceland's second largest volcano and its caldera is showing signs of collapse. Subsidence of more than 20m has been measured in the caldera that is capped by a layer of ice over 700m thick. There is a possibility if the caldera does collapse that we could see an explosive eruption. 2. The fissure eruption is releasing massive quantities of SO2 which can have significant health implications to those downwind. We have already seen elevated levels in Norway and Finland, whilst levels in certain Icelandic towns have also been measured at more than 10 times safe limits. 3. Following on from point 2, the lava being released from this eruption has much higher gas levels than those found in some non-Icelandic volcanoes (like Pinatubo). 4. Should the current eruption be maintained for an extended period and/or the release of lave increase, the amount of SO2 released may start to impact global temperatures in the Northern Hemisphere. It should be noted that whilst Pinatubo released significant amounts of SO2 it did so from a position far closer to the equator. Historic events in Icelands past have had a significant impact on NH temp measurements. To sum up. There are any number of scenarios from an explosive eruption to continuing massive releases of lava and SO2 that could have significant global consequences. These scenarios are now much more a realistically possibility and this is why Icelandic authorities have expressed concerns. On the other hand if activity subsides quickly or at least continues at a reduced level then the global consequences should be minimal at this stage. Unfortunately, at the moment, the activity is showing no definite signs of ramping down. In fact in the past 24 hrs we've seen an increase in larger tremors near Bardarbunga and tremors start to propagate out along the ridge to the West after previously being confined to an area from Bardarbunga to Askja. Should the current eruption be maintained for an extended period and/or the release of lave increase, the amount of SO2 released may start to impact global temperatures in the Northern Hemisphere. It should be noted that whilst Pinatubo released significant amounts of SO2 it did so from a position far closer to the equator. I thought I'd add a couple of interesting articles regarding volcanoes and volcanic sea mounts. Regarding the sea mounts, the following report confirms what I have eluded to in the past re: more volcanic mounds to be discovered (which were previously unknown) which may take scientists by surprise. It does not surprise me in the least that more and more volcanoes are 'awakening' these days given the amount of plate activity and the potential of other influencers having an effect on volcanic and magma movements. There is alot of volcanic activity around the globe these days. But the flow of lava in Hawaii is strangely beautiful, even though it is causing some issues for the folks there. Across the planet, many previously thought of extinct or 'silent' volcanoes are murmuring, some to the surprise of the scientists and some local folks alike. 6 registered (Homer, mysteriousbrad, ol mate, Sandbank, Sidney, Adaminaby Angler), 58 Guests and 3 Spiders online. Generated in 0.025 seconds in which 0.004 seconds were spent on a total of 13 queries. Zlib compression disabled.